Though hundreds of thousands of grant opportunities exist, finding the right one can be a challenge. 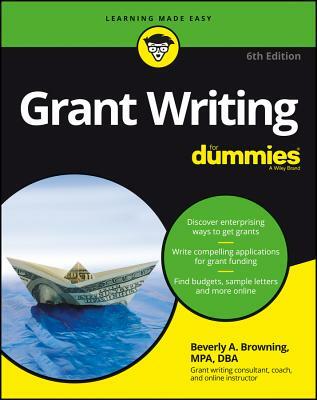 Grant Writing For Dummies, 6th Edition offers expert guidance for locating available grants, carefully applying, and ultimately winning a grant. From writing compelling applications to properly adhering to strict guidelines and parameters, it takes the intimidation out of the process and shows you how to increase your ability to get a piece of the billion-dollar pie for your non-profit or for-profit organization. You'll even have access to sample applications, letters, and budgets online to help you stand out from the competition. As the amount of established granting foundations increases, so does the amount of money available. But for most grant-seekers, the application process can be long, tedious, and highly competitive. Packed with step-by-step instructions for registering with Grants.gov, up-to-date grant opportunities available via newly created websites and online databases, updated resources and best practices--and more--Grant Writing For Dummies is your all-encompassing guide to navigating the entire grant-writing process. Dr. Beverly A. Browning, MPA, DBA, is a grant writing course developer who has been consulting in the areas of grant writing, contract bid responses, and organizational development for 43 years. She has assisted clients throughout the United States in receiving awards of more than $430 million.